AFC Dunstable were beaten in the Southern League Division East play-offs, going down 2-0 at Hartley Wintney on Tuesday night. 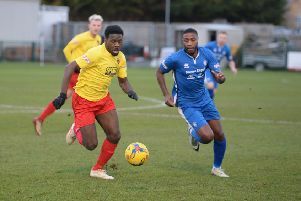 The hosts, who had finished fourth, just three points above Steve Heath’s side in the table, went ahead on 12 minutes through Dean Stow’s goal direct from a free kick. It was 2-0 on the half hour mark as Nick Ciardini netted, leaving AFC with a mountain to climb. The visitors made two changes at half time, bringing Leon Cashman and Jermaine Hall on for Moses Olaleye and Kyle Ajayi, but despite also introducing Louis Bircham midway through the second period. they couldn’t find a way back into the game. Subs not used: R Frater, Griffiths.